Show that special someone that you’re thinking of them on their special day, with our delicious Chocolate Fudge Birthday Cake. 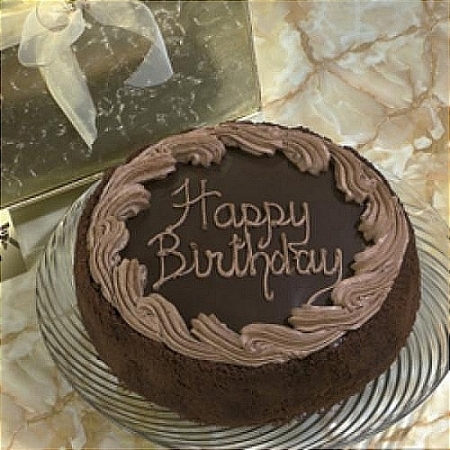 A moist dark chocolate cake, with a fudgy filling, is covered with chocolate ganache frosting; than we hand decorate each cake with a light chocolate border, and “Happy Birthday” greeting. 10" cake comes packed in a Gold Gift Box with Ivory ribbon and bow. 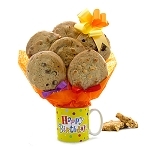 A gift card with your personal gift message will be included. 7" serves 8 people, 10" serves 16 people. 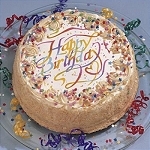 The Chocolate Birthday Cake is shipped frozen, and packed with dry ice or gel packs. When the Chocolate Birthday Cake arrives, the dry ice will usually have evaporated, and the gourmet dessert will be semi-thawed.If you would like to re-freeze it for future use, you can do so; keep the Chocolate Birthday Cake well wrapped in its original interior shrink wrap and box, store in the freezer up to a month. Remove interior plastic wrap before thawing in refrigerator for 2-4 hours.If the Chocolate Birthday Cake is completely thawed upon arrival, refrigerate, and serve within 2 days. This gourmet cake can be stored in the refrigerator 2-3 days.